AMSOIL founder A.J. Amatuzio coined the phrase "extended drain intervals" back in 1972 with the introduction of AMSOIL 10W-40 Synthetic Motor Oil, formulated for 25,000-mile/one-year drain intervals. Not only was AMSOIL motor oil the first synthetic oil to pass American Petroleum Institute (API) service requirements, AMSOIL INC. was the only motor oil company promoting oil drains beyond 3,000 miles. Today, motorists are still bombarded with propaganda from the major oil companies promoting 3,000-mile oil changes. However, the industry is slowly but surely coming around. Vehicle manufacturers typically suggest 5,000- to 7,500-mile intervals in their owners manuals, and many manufacturers have also started incorporating oil life monitors into their vehicles, allowing motorists to safely extend drain intervals by monitoring oil life and alerting drivers when the oil needs changing. Competing oil companies have also begun marketing their own synthetics, some claiming service lives extending beyond 3,000 miles. Lubes-n-Greases Automotive Editor David Mc Fall, once with the American Petroleum Institute recently tackled the issue of extended drain intervals in his March column, criticizing the standard 3,000-mile oil change and referring to the American motor oil market as "shackled." "In Europe the average engine oil drain interval for current gasoline-fueled cars is about 10,000 miles," explains Mc Fall. "In the United States, indicates the Automotive Oil Change Association, the average drain interval followed by most drivers is somewhat less than 5,000 miles—one-half of Europe's. "Every year in the United States, this too-short drain interval results in the unneeded production of 300 million to 400 million gallons of engine oil; excess consumer expenditures of around $1.5 billion; and tens of millions of unnecessary oil changes." Not only are these unnecessary oil changes an expense to consumers, explains Mc Fall, but they have an environmental cost as well. "The added environmental cost of having an average 5,000-mile oil drain interval (instead of 10,000 miles, as in Europe) may be nearly 100 million gallons of engine oil being dumped, untreated, into the U.S. environment annually." Call's examination of Mobil 1, Shell and AMSOIL demonstrates the differences among companies who are shackled to the current system and one who isn't. According to an Exxon Mobil spokesperson, "Car owners should follow the oil change intervals specified by the manufacturer. We believe it is inappropriate to recommend drain intervals that may conflict with those set forth by the car manufacturer's specifications." "Here, in a nutshell," says Mc Fall, "is this observer's take on Exxon Mobil's and the oil industry's 'owner's manual' position: It is designed solely to increase motor oil sales." He backs it up by mentioning that Mobil 1 SuperSyn motor oil claims to meet European ACEA A5 and B5-02 specifications, two specifications intended to extend oil drain intervals. "If the oil can be used in Europe for extended drain intervals, why doesn't Exxon Mobil notify U.S. consumers of that capability?" asks Mc Fall. Although Shell Oil Products, owner of Pennzoil-Quaker State, has broken through the shackles enough to offer an API unlicensed oil specially formulated for higher mileage engines, they make no mention of a recommended drain interval, preferring instead to avoid the issue and keep consumers in the dark. Mc Fall marvels at the success of the independent motor oil company that offers drain intervals up to 11 times longer than the standard interval offered by conventional oils, saying, "Purists can sniff that AMSOIL's data isn't derived from a controlled field study, but the sheer mountain of vehicle miles over three decades, and the absence of any confirmed performance, wear or maintenance issues, speaks volumes." Mc Fall sums up his column by highlighting the true value of AMSOIL Synthetic Motor Oil, stating the cost may be "two to three times higher than most retail conventional oils but if you can securely count on a 15,000- to 25,000-mile drain interval, it's a flat-out bargain, not to mention providing a clear environmental bonus." So, what is it that allows AMSOIL motor oils to be used for extended drain intervals, while other oils must be changed significantly sooner? First, the synthetic base stocks with which AMSOIL motor oils are formulated are worlds apart in quality compared with conventional base stocks. The synthetic molecules are uniform in size and shape, resisting the vaporization that boils off the smaller molecules of conventional motor oils and leaves behind a thicker, higher viscosity oil that compromises engine protection. AMSOIL motor oils surpass even the most stringent European volatility standards, providing superior protection for extended drain intervals. Second, AMSOIL spares no expense when it comes to additives, selecting the most robust additive packages on the market. These additives keep AMSOIL motor oils shear stable, resist the degrading effects of varnish and sludge, keep engine components clean and deposit-free and effectively resist rust, corrosion and foaming. By using only the highest quality synthetic base stocks and additives available, AMSOIL motor oils are capable of extended drain intervals, all while maintaining performance, providing long-term wear protection and fuel economy, keeping engines clean and deposit-free, providing cold weather starts and protecting against rust and corrosion. 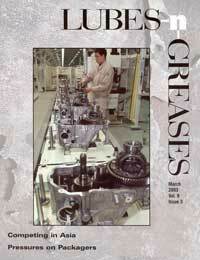 For a copy of David McFall's column on AMSOIL, contact Lubes-n-Greases at (703) 536-0800. Lubes 'n' Greases logo is a Registered Trademark of LNG Publishing Company, Inc.